Imitation Chalk notice board. 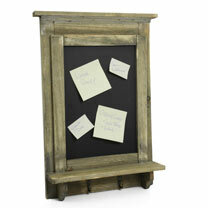 Ideal for use with post-it notes in the shed or conservatory. Plus a convenient place to hang your keys on one of its two hooks. No fixings included. 27 x 42 x 7.5cm.